"Orthodox Church of Greece" redirects here. For the Old Calendarist church by that name, see Orthodox Church of Greece (Holy Synod in Resistance). The Church of Greece (Greek: Ἐκκλησία τῆς Ἑλλάδος, Ekklisía tis Elládos [ekliˈsia tis eˈlaðos]), part of the wider Greek Orthodox Church, is one of the autocephalous churches which make up the communion of Orthodox Christianity. Its canonical territory is confined to the borders of Greece prior to the Balkan Wars of 1912–1913 ("Old Greece"), with the rest of Greece (the "New Lands", Crete, and the Dodecanese) being subject to the jurisdiction of the Ecumenical Patriarchate of Constantinople. However, most of the dioceses of the Metropolises of the New Lands are de facto administered as part of the Church of Greece for practical reasons, under an agreement between the churches of Athens and Constantinople. The primate of the Church of Greece is the Archbishop of Athens and All Greece. Adherence to the Orthodox Church was established as a definitive hallmark of Greek ethnic identity already in the first modern Greek constitution, the "Epidaurus Law" of 1822, during the Greek War of Independence. The preamble of all successive Greek constitutions simply states "In the name of the Holy, Consubstantial and Indivisible Trinity", and the Orthodox Church of Christ is established as the "prevailing" religion of Greece. Mainstream Orthodox clergy's salaries and pensions are paid for by the State at rates comparable to those of teachers. The Church had previously compensated the State by a tax of 35% on ordinary revenues of the Church, but Law 3220/2004 in 2004 abolished this tax. By virtue of its status as the prevailing religion, the canon law of the Church is recognized by the Greek government in matters pertaining to church administration. This is governed by the "Constitution of the Church of Greece", which has been voted by Parliament into law. Religious marriages and baptisms are legally equivalent to their civil counterparts and the relevant certificates are issued by officiating clergy. All Greek Orthodox students in primary and secondary schools in Greece attend religious instruction. Liaisons between church and state are handled by the Ministry of National Education and Religious Affairs. Supreme authority is vested in the synod of all the diocesan bishops who have metropolitan status (the Holy Synod of the Church of Greece, Greek: Ἱερὰ Σύνοδος τῆς Ἐκκλησίας τῆς Ἑλλάδος Hierà Sýnodos tês Ekklēsías tês Helládos [ieˈra ˈsinoðos tis ekliˈsias tis eˈlaðos]) under the de jure presidency of the Archbishop of Athens and all Greece. This synod deals with general church questions. The Standing Synod is under the same presidency, and consists of the Primate and 12 bishops, each serving for one term on a rotating basis and deals with details of administration. The church is organised into 81 dioceses. 36 of these, located in northern Greece and in the major islands in the north and northeast Aegean, are nominally and spiritually under the jurisdiction of the Ecumenical Patriarchate of Constantinople, which retains certain privileges over and in them—for example, their bishops have to acknowledge the Patriarch as their own primate during prayers. They are called the "New Lands" (Νέαι Χώραι, or Néai Chōrai) as they became part of the modern Greek state only after the Balkan Wars, and are represented by 6 of the 12 bishops of the Standing Synod. A bishop elected to one of the Sees of the New Lands has to be confirmed by the Patriarch of Constantinople before assuming his duties. These dioceses are administered by the Church of Greece "in stewardship" and their bishops retain their right of appeal (the "ékklēton") to the Patriarch. The dioceses of Crete (Church of Crete) and the Dodecanese, and the Monastic Republic of Holy Mount Athos remain under the direct jurisdiction of the Patriarchate of Constantinople; they are not part of the Church of Greece. The Archdiocese of Crete in particular enjoys semiautonomous status: new bishops are elected by the local Synod of incumbents, and the Archbishop is appointed by the Ecumenical Patriarchate from a three-person list (the triprósōpon) drawn by the Greek Ministry of National Education and Religious Affairs from among the incumbent Metropolitans of Crete. As in other Orthodox Churches, male graduates of seminaries run by the church (and financed by the Greek State), may be ordained as deacons and eventually priests. They are allowed to marry before their ordination as deacons, but not afterwards. The vast majority of parish clergy in Greece are married. Alternatively, they may enter monasteries and/or take monastic vows. Monastics who are ordained as priests, and possess a university degree in theology, are eligible as candidates for the episcopate (archimandrites). Women may also take monastic vows and become nuns, but they are not ordained. Monasteries are either affiliated to their local diocese, or directly to one of the Orthodox Patriarchates; in the latter case they are called "Stauropegiac" monasteries (Stayropēgiaká, "springs of the Cross"). A split (schism) occurred within the Church in 1924 when the Holy Synod decided to replace the Old Calendar (Julian) with a hybrid calendar—the so-called "Revised Julian Calendar"—which maintained a modified Julian dating method for Easter while adopting the Gregorian Calendar date for fixed feasts. Those who refused to adopt this change are known as Old Calendarists (palaioimerologites in Greek) and still follow the old Julian Calendar. They themselves have suffered several schisms, and not all Old Calendarists comprise one Church. They refer to themselves as "Genuine Orthodox Christians", and the largest group associating itself with the Old Calendarists is the Synod of Archbishop Chrysostomos II Kioussis. This Synod has obtained government recognition as a valid Orthodox Church, although this is not in communion with the Church of Greece or the other Orthodox Churches. Greece was an early center of Christianity. Upon formation of the Patriarchate, the Church was formerly a part of the Ecumenical Patriarchate of Constantinople. Under Ottoman rule, the Muslims had no control over the church. 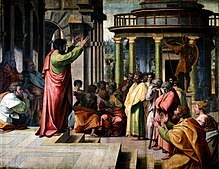 With the establishment of the Greek kingdom, however, the government decided to take control of the church, breaking away from the patriarch in Constantinople. The government declared the church to be autocephalous in 1833 in a political decision of the Bavarian Regents acting for King Otto, who was a minor. The decision roiled Greek politics for decades as royal authorities took increasing control. The new status was finally recognized as such by the Patriarchate in 1850, under compromise conditions with the issue of a special "Tomos" decree which brought it back to a normal status. As a result, it retains certain special links with the "Mother Church". There were only four bishops, and they had political roles. In 1833 Parliament dissolved 400 small monasteries having fewer than five monks or nuns. Priests were not salaried; in rural areas they were peasant farmers themselves, dependent for their livelihood on their farm work and from fees and offerings by parishioners. Their ecclesiastical duties were limited to administering the sacraments, supervising funerals, the blessings of crops, and exorcism. Few attended seminaries. By the 1840s, there was a nationwide revival, run by traveling preachers. The government arrested several and tried to shut down the revival, but it proved too powerful when the revivalists denounced three bishops for purchasing their office. By the 1880s the "Anaplasis" ("Regeneration") Movement led to renewed spiritual energy and enlightenment. It fought against the rationalistic and materialistic ideas that had seeped in from secular Western Europe. It promoted catechism schools, and circles for the study the Bible. The 20th-century religious revival was led by the Zoë movement, which was founded in 1911. Based in Athens but operating in decentralized fashion, it reached a membership of laymen as well as some priests. The main activities include publications and the nationwide Sunday School movement in 7800 churches reaching 150,000 students. Zoë sponsored numerous auxiliaries and affiliated groups, including organizations for professional men, youth, parents, and young women nurses. A strong effort was made to circulate Bibles, illustrated novels, pamphlets, and other religious materials. A liturgical movement encouraged the laity to a greater awareness in the Eucharist, and more frequent Communion. Seminaries were built in the 20th century, but most of the graduates entered teaching rather than parish work. In 1920, only 800 of Greece's 4500 priests had any education beyond the elementary level. By 1959, out of 7000 priests no more than five percent had completed university and seminary training. Monastic life declined sharply, although it continued at remote Mount Athos. Routine church life was highly disrupted by the Second World War and subsequent civil war, with many churches burned, and hundreds of priests and monks killed by the Germans on the one hand or the Communists on the other. Head of the Church of Greece and of the Holy Synod is Archbishop Ieronymos II (Ioannis Liapis), Archbishop of Athens and All Greece (2008–). 2 The Metropolis of Trikke was separated from the Metropolis of Stagi (and Meteora) in 1981 but still bears the titular name "Trikke and Stagi"
^ "Church of Greece". oikoumene.org. World Council of Churches. Retrieved October 14, 2017. ^ Demetrios J. Constantelos, The Zoë Movement in Greece," St. Vladimir's Seminary Quarterly (1959) vol 3 pp 1-15 online. Online Greek Orthodox Typikon e-typikon.comdeprecated as of Feb. 2019. 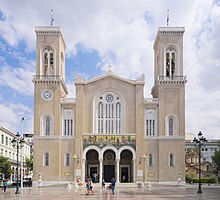 Wikimedia Commons has media related to Church of Greece.